One Chicago-area green entrepreneur is making it easier for homeowners looking to de-clutter in an eco-friendly way by taking their stuff and donating, recycling and avoiding the landfill. Fran Horvath started Greenout Cleanout as a full-fledged company about six months ago, but she’s been doing this type of work on and off for the last decade. As a real estate agent starting out 10 years ago, Ms. Horvath began helping clients clear out lots of stuff from their homes while they were getting ready to put their houses up for sale. And because she was eco-minded, she made efforts to recycle what she could from these homes. She’d donate items to organizations like the Salvation Army or the Hadassah House Resale Shop in Skokie to reuse in other people’s homes or found other resources for recycling. She prided herself on sending very little to landfills. Those sideline efforts have turned into the focus of Ms. Horvath’s business. 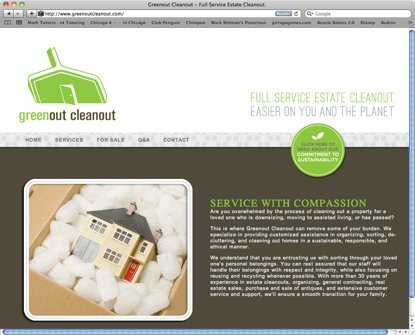 She decided to launch a venture dedicated to cleaning out other people’s homes because she saw the demand for those services grow. Ms. Horvath also had another valuable skill: In a former career, she was a professional organizer. She’s been getting rid of other people’s junk for a long, long time. Ms. Horvath finds new homes for most furniture and clothing. And she knows how to be environmentally responsible by safely getting rid of items that contain toxic chemicals, such as cleaning supplies or paint. She brings them to a toxic waste recycling center on Goose Island run by the city of Chicago. Ms. Horvath also drops off old computers or medications that could be unsafe if they were tossed in a dumpster or poured down a drain. Ms. Horvath, 49, was also one of the founding members of the Business Alliance for a Sustainable Evanston, or BASE. As a board member of the non-profit, she organizes educational events for North Shore businesses that are looking to become more sustainable. Crain’s caught up with Ms. Horvath to learn more about the green way of scaling down the insides of a home. Crain’s: Is it easier to recycle or find new uses for household and personal possessions today compared to a decade ago? Ms. Horvath: In 2001, it wasn’t so easy to get rid of some things, such as medications, cleaning supplies, paint. Back then, Freecycle and Craig’s List didn’t really exist in a big way. Now I can put an old couch on Craig’s List and sell it quickly. But then, just like now, I could always put a couch in the alley and it’s usually gone within 20 minutes. What are some of the most challenging items to recycle or repurpose from a home? There’s not much that has to go in the garbage. A lot of places aren’t taking mattresses because of the bedbug issues. I also wouldn’t want to donate them if they’re stained and nasty. Broken little kitchen appliances that aren’t metal are tough too because I can’t get them donated and they won’t get recycled. Things with mold or other hazardous waste on them are impossible to get rid of. Does it matter to clients that you emphasize sustainable practices when you are getting rid of belongings in a house? The people who already know about sustainability find this kind of service very important and it’s a great fit. People who don’t know about it usually learn more about recycling while I’m working with them and that’s a good thing. I don’t get a dumpster and park it outside their home when I’m working. My clients like that. Do you have plans to expand your business beyond just getting rid of other people’s clutter? Yes. I’m soon going to be renting a space in Morton Grove where I can consign for clients things that can be sold. I also refinish furniture, so I plan to sell some pieces in that new space. I love being able to take a piece of sad and neglected furniture and turn it into something beautiful and functional once again. This entry was posted in Green Scene and tagged cleaning, entrepreneurs, green, GreenScene, Horvath, Nemes, residential, startups. Bookmark the permalink.